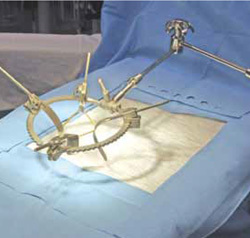 The Bookler Table Mounted Retractor Product Line is made up of well over 100 different items. To assist you with ordering exactly what is required, we offer and array of pre-configured sets. The setscan be a complete procedural system, a starter system that has everything except the blades or an Accessory Set which include products for a specificprocedure. The Accessory Sets should be combined with an existing system for use. We are proud to offer The Mini-Bookler Table Mounted Retractor System for Small Incision, Neo-natal and Pediatric Surgery. Along with "right-sizing" rings, ratchets and blades, the most significant change made was theelimination of the traditional Field Post and Horizontal Bars.